Consumers have come to expect ratings and reviews for just about anything. Research shows that while social media is critical for purchase inspiration, consumers increasingly trust and rely on reviews and recommendations when in the decision-making process. By the time consumers reach the point of purchase, 90 percent have been influenced by an online review. For 68 percent of shoppers, trustworthy reviews are more influential than recommendations from family and friends when deciding to buy. Mavrck customers have seen, on average, a 34 percent projected sales lift per product by incorporating ratings and reviews as part of their overarching influencer marketing strategies. In a world where consumers’ have an infinite amount of choices and brands no longer dictate the message, social proof drives brand success. With ratings and reviews impacting every stage of the customer decision journey, both the quality and quantity of your product reviews have equal power to improve sales by orders of magnitude and should be integrated into your business’ influencer marketing strategy. Despite the majority of consumers looking at ratings and/or reviews prior to making a purchase, currently, only 38 percent of consumers click in to see the online reputation or profile of the person who generated the rating or review. In a world where even reviews can be gamified (as seen with the FTC’s first-ever case challenging fraudulent online reviews on Amazon), consumers will soon begin looking for additional layers of social proof on top of ratings and reviews to verify credibility. This is evidenced by the fact that 43 percent of consumers noted that, if an influencer is the one generating the rating or review, it would add credibility. If your marketing team struggles to generate the breadth and volume of high-quality product ratings and reviews required to achieve your business goals, you are not alone. Scaling quality ratings and reviews requires getting the product or service in the hands of as many credible people as possible – and that can be challenging. However, for marketers running influencer marketing programs, ratings and reviews generation is a simple, value-add opportunity. 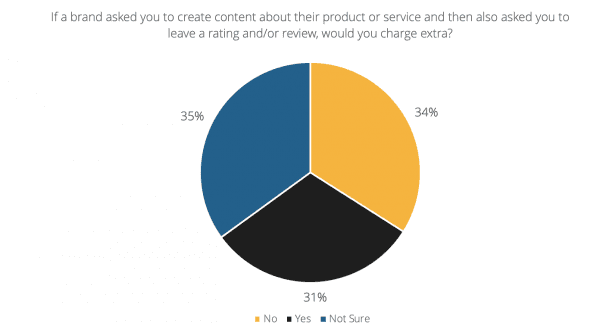 Not only do the majority of social media influencers (85 percent) feel comfortable leaving ratings and or reviews after creating content, but only 31 percent would charge extra for the additional request. By prompting social media influencers, who have just shared their product experiences on their own channels, to submit a product review as well, marketers can improve efficiencies and better integrate social proof at every touch point of the customer experience. Product photos, videos, and other forms of social proof paired with written reviews are becoming the standard review format, enabling customers to exchange all relevant points-of-view about the product, its features, and use cases. The proliferation of social proof paired with ratings and review content has completely transformed how consumers shop and make decisions – so much so that consumers have come to expect ratings and reviews just about every time they purchase something. Gone are the days where product reviews only exist on product pages – ratings and reviews are displayed in social feeds (earned and paid), review sites, mobile apps, brand.com, e-commerce destinations and now, in-store. By incorporating ratings and reviews in-store, retailers are granting consumers social proof at every touchpoint (on and offline), providing a frictionless shopping experience and accelerating the path-to-purchase. 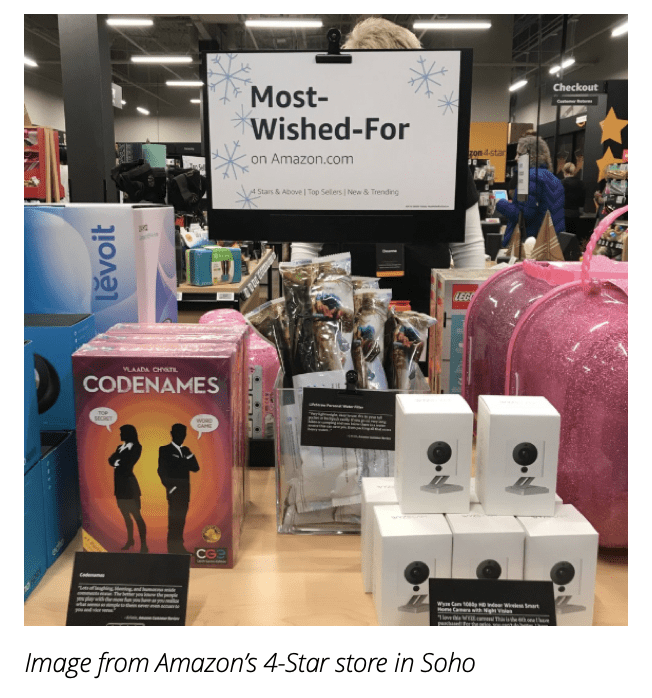 Amazon, specifically, has pioneered this movement with its 4-Star Stores, Bookstores, Go Stores, and other physical store locations. Where Amazon has been successful hasn’t necessarily been in the creation of new touch points, but instead is in its ability to seamlessly merge the online and offline worlds, using data to drive both design and experience. This new, phygital world presents an opportunity for retailers looking to expand the use and value of influencer- and user-generated content, specifically emphasizing the need for rating and reviews in-store, as well as online. Retailers, specifically, have first-mover opportunities to utilize ratings and reviews to inspire store organization and design (think: a five-star aisle, a most popular item section, a positive reviews corner, influencers’ favorite products, etc.). The growth of connected devices and smart home digital assistants like Amazon’s Alexa, Google Home and Duplex will continue to influence the way consumers shop. There are roughly 20 million smart speakers in the U.S., and 57 percent of smart speaker owners have bought something with voice. While the future of voice-enabled purchases starts with voice ordering, they will also soon include “Alexa, read me reviews for this product,” “What did XYZ influencer think of this product?” or, technology could even enable customers to hear influencers share their own reviews directly. Influencers may literally become the “voice” of the brand. As such, marketers with any type of retail or e-commerce experience will need to understand what these voice integrations mean and how information, like ratings and reviews, enables them. For Amazon specifically, the most important ranking factors for brands to be selected by Alexa in voice search comes down to three factors: search relevance, sales performance and order history. While rating and reviews don’t directly play into the voice search selection (currently), they do, however, play into recommendations – which are selected by 85 percent of Amazon customers when voice shopping. Specifically, Alexa recommends products with the “Amazon Choice” badge for the given search term, which is obtained by having a “popular product” as determined by positive customer reviews, in addition to having a high sales velocity. Although Alexa recommends products with positive reviews, it is, however, also worth noting that negative reviews can also benefit your business – 85 percent of consumers look for negative reviews in order to make informed purchase decisions and among consumers between the ages of 18 to 29, this number raises to 91 percent. While negative reviews do provide consumers with a more authentic representation of your product experience, 51 percent of consumers expect businesses to respond to their negative review within seven days, so it is imperative that marketers have a customer service plan in place to respond to any and every negative review. With Mavrck’s expanded ratings and reviews capabilities and performance management, marketers can collaborate with influencers to generate content and product reviews as part of the same campaign. To learn more about these features and best practices, download our product overview.